For anyone that hasn’t been exposed to this part of the motorcycle culture, rodeo games have a long and storied history. Through the years they have held a place of endearment with rally goers, something fun to do with your motorcycle and your friends at the events. These rodeo games over the years have drawn nearly a thousand spectators and over two dozen contestants turned out to play the games. Games like the Barrel Roll, where riders have to roll a barrel with their front wheel across the field, the Plank Walk, that tests a riders ability to keep two wheels up on a two by six plank from one end to the other and the ever popular Slow Ride in which the last, not the first person across the finish line is the winner. 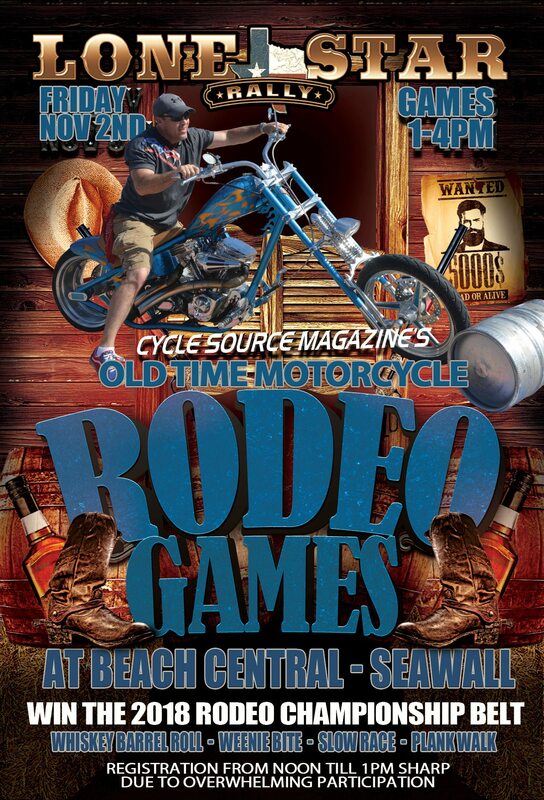 If you’re looking for a whole different side of the Lone Star Rally this year, mark your calendars for Friday Nov. 2nd where the Lone Star Rally will set up the field of competition right in front of Beach Central. Sign ups start at noon and there is no entry fee, you just have to bring your best rodeo skills because in Texas, these riders mean business.